and then we all curled up and cuddled on the sofa to watch movies on Netflix. It was such a lazy day but such a wonderful weekend for the four of us. We enjoyed taking pictures and doing something we love the most which is spending time with each other. We had simple but filling food which didn't require much cooking. For lunch we had hotdog sandwich and chips which Ryan prepared and for snack, we had a bucket of popcorn and some Chocolate Crinkles. It was raining the whole day and it was really cold, so for dinner, I thought of making soup. It's my father's favorite soup. Oh actually, it's every Batangueño's favorite and it's called Goto, which simply refers to Tripe Soup. The goto I grew up with is different from the “Goto Arroz Caldo” most Filipinos know. Like the traditional Chicken Arroz Caldo that I've shared with you before, Goto Arroz Caldo is made of glutinous rice but has tripe strips instead of chicken. Batangas Goto, on the other hand, is not congee type. It has no rice in it. 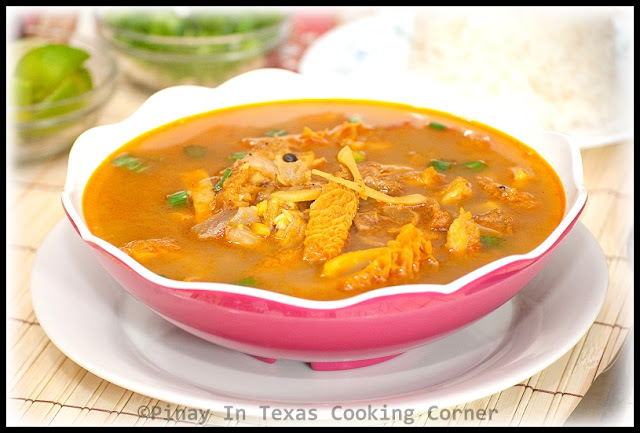 It is simply a soup made of tripe, cow’s skin, intestines, liver, tongue, blood and beef simmered and seasoned with onions, garlic, ginger, pepper and salt. To add flavor and color, it is also cooked with annatto powder. Goto is best eaten while hot. It is usually served with soy sauce and calamansi dip with crushed chilies which reduces the gamy taste of the cow’s entrails. I know that many of you will be grossed out by the mere thought of eating this kind of soup. But this has become a favorite to many Batangueños. 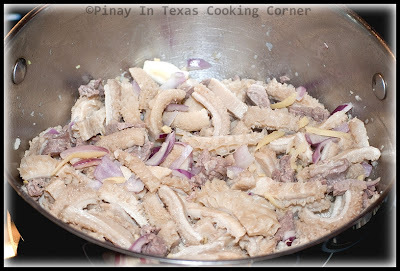 The variety of soft, tender textures of meat and spongy skin and the light stickiness of tripe in it make this a hit to the people of Batangas and to those who have experienced eating this. When I was still in the Philippines, I've seen how restaurants serving goto overflow with people waiting in turns to savor this native dish during lunch time. Available at 40Php-90Php($1- $2) per bowl, it is really cheap considering that it is so flavorful and really filling when eaten with rice. If you are someone who's on the lookout for an extraordinary gastronomic experience, you should try this. Not only is this soup perfect for the cold weather and so filling when eaten with rice, it is also the perfect cure for hangover. A hot bowl of this flavorful soup will surely take away your headache and will put you back on track. Check it out! 1. 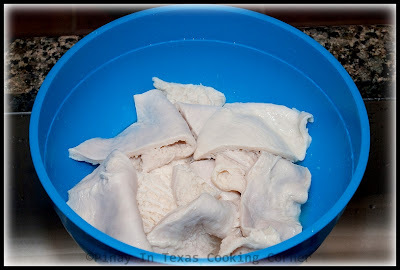 Clean beef tripe. Rinse it well under running water. Rub with rock salt and soak in a cup of vinegar for 15 minutes, then rinse again under running water. 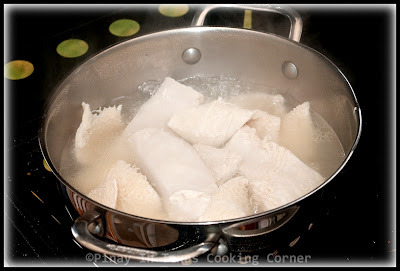 Parboil for about 15 minutes, discard water, rinse tripe again then drain. Ryan did the parboiling part 2x. 2. In a pot, put in 10 cups water, tripe and beef. Bring to a boil over medium heat until scum appears on the surface. Remove all the scum or brown bubbles that will form on top of the broth. Add 3 cloves crushed garlic, half of the onion, 1 thumb-sized crushed ginger, bay leaf, 1/2 Tbsp salt and 1/2 tsp peppercorns. 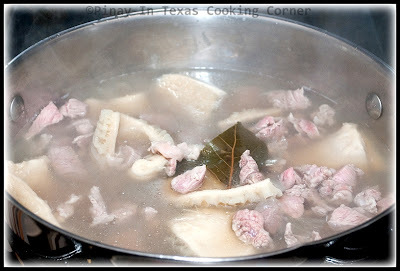 Cook until both tripe and beef are tender, about 1 1/2 hrs. 3. 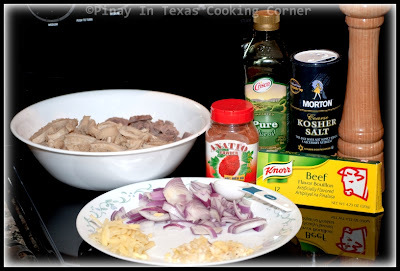 Remove tripe and beef from broth. 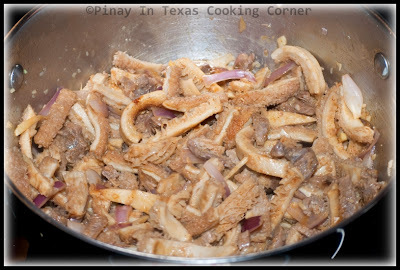 Cut tripe into strips. 4. In a pan, saute garlic, onion and ginger in olive oil until onion is almost translucent. 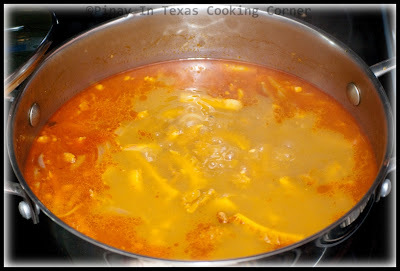 Add tripe and beef. Saute for 3 minutes. Add annatto powder and beef cubes. Saute until beef cubes ares melted. 5. Add sauted mixture into the broth. Bring to a boil. Add salt and pepper to suit your taste. Let simmer for 15 minutes. 6. Transfer to individual serving bowls. Top with green onions and drizzle with lime/lemon. Serve hot with steamed rice. This soup is very similar to our Pig Organs Soup. Almost every organs and parts of the pig including blood (but so sad to say that the blood was banned due to hygiene). My most fav are the pig's liver and stomach. Whenever there's any offering occasions, my parents will buy at least two pig's stomachs to cook soup with pork ribs, button mushrooms, sea cucumbers and lotsa white peppercorns (but still kid-friendly)=YUMMILIOUS!! 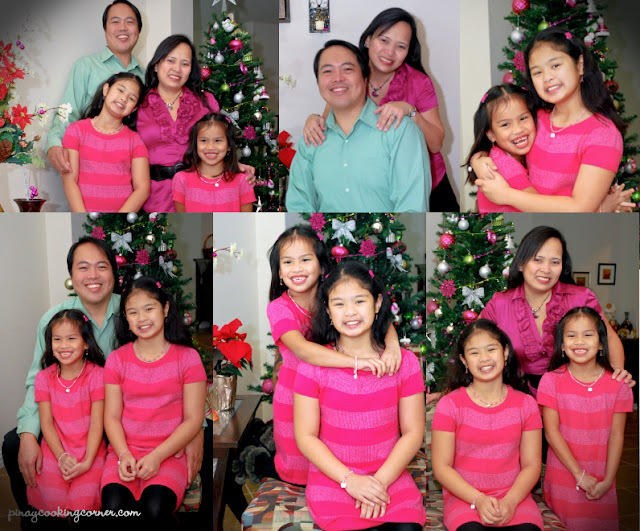 Great family pictures here! it would be hard to decide on one for the Christmas cards. Nothing like a warm soup on a cold day, your does look delicious as well as comforting. Have a great day! Lovely, lovely photos, Tina. That cheered me up. The weather suddenly dipped and I really would kill for a bowl of your Batangas goto. I've never heard of that but that is exactly how we start our goto arroz caldo (we just call it goto) then the rice is added. I have to admit I was grossed out by the mention of the other ingredients. Thanks for omitting those. Although, being half Italian, I should be a "fan" of tripe...sadly to say, I'm not! No fan of anything that has to involve with intestines of any animals! Love your family Christmas photos...you have beautiful daughters that I'm sure you are so proud of them! Thanks for sharing...think I will sit this recipe out! Tina these family photos are just beautiful. I love them all. Your girls are gorgeous. 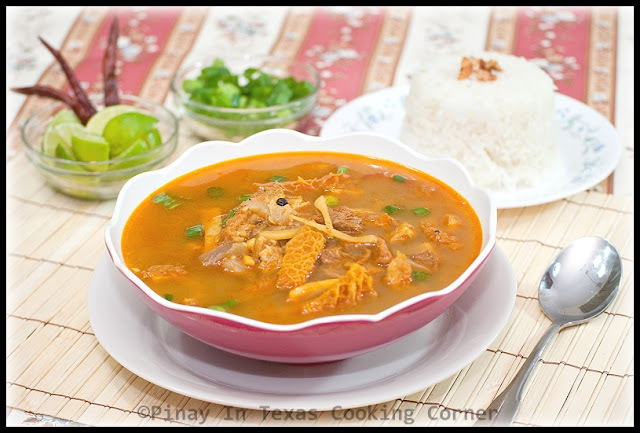 The tripe soup looks really good, I've never had it. Soup looks delicious, Tina. When I saw your princess photos my memories about same dresses appa and amma used to buy for me and my sister came back . They both are cutie pies. Lovely pictures. Looks like the Christmas fever is already in place Tina and sure its good to feel that way. It has been raining dogs and cats over at Malaysia but I am currently in Bangkok and you won't believe it that its so hot. I did go to Ayuttaya and no more rain but all the flood water in the padi field and plantation is stuck, looks like big ponds here and there. Btw, its lovely a lovely soup with the all the ingredients you have added are my fav but you know as usual which I always share with you, we don't eat beef, maybe can try with chicken for a change. I saw so many happy faces in the photos and it looks like you had a great time! The soup is ideal ofor this time of season, hearty and filling! I love your family pictures, so precious. :) Your girls are adorable. Like Mommy like Daughters. Thanks for sharing. This post put the biggest smile on my face this morning! Such a beautiful family and beautiful day you had. So nice to end it with your dad's favorite soup, making it even more special, I'm sure. I noticed you all match the ornaments on the tree behind you! 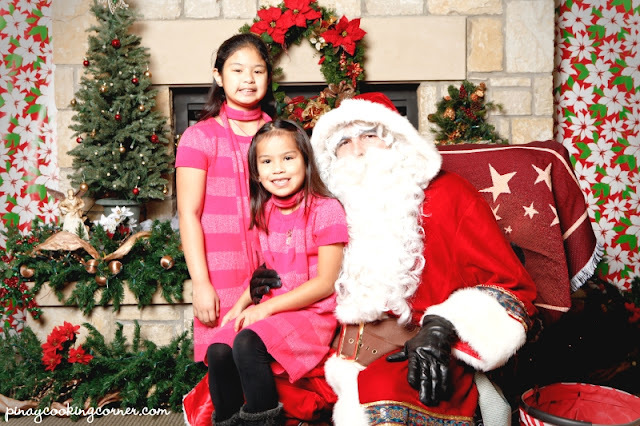 I love how the girls and you hammed it up with Santa. It's rainy and unseasonably warm here today, wish I could stay in my pjs all day! Love your family portraits, Tina! The gals are so adorable :) Here's wishing u happiness & love always! Thanks everyone for all the nice comments! @Lyn: I'm fine with liver & stomach too, but I don't eat them that frequent though. 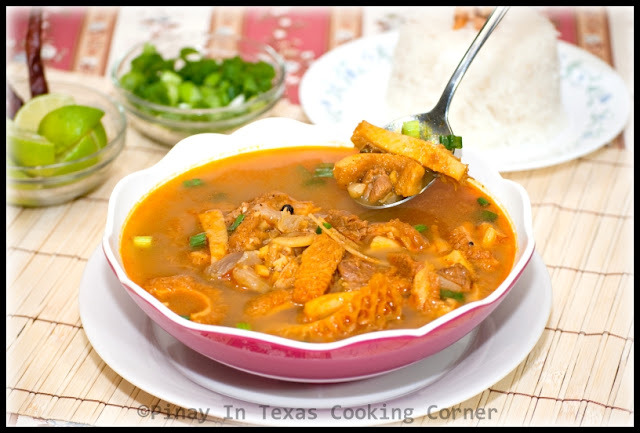 The look of this goto is similar to Mexican menudo with tripe. I love the texture and color, Tina! As always, you make delicious dish.